With £5 to spend on a meal you can really splash out and go crazy! Whether you spend it all on one sumptuous meal for yourself, or spread the budget and make a dish that will feed your housemates as well, there are loads of ideas for anyone with a fiver in their wallet. You can indulge in some tasty fish and seafood or more exotic meat cuts and you might even be able to stretch to a dessert as well! Seasonal fruit and ice cream or cream is hard to beat and should provide the best value for money. Here are a couple of quick recipe ideas that should have you coming in under budget. 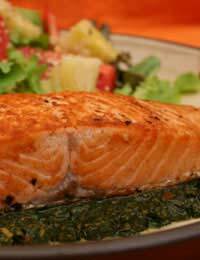 Look out for special offers on salmon or buy a larger pack to make it more economical. Either way you should be able to get plenty of change from a fiver for a couple of salmon steaks or fillets. Then, simply spread a little green pesto over each one and bake in a preheated, medium oven for about 30 minutes, or until cooked through. Meanwhile, measure out enough couscous for two into a large bowl, just cover with boiling water, add a knob of butter and cover with a plate. This will take about 15 minutes to steam cook. Chop a mixture of fresh basil and parsley and mix this into the couscous. Serve with the salmon. This is another easy dish that would be great for a romantic meal for two. There’s nothing to it really. Wrap each chicken breast in a slice of bacon (or two if the chicken is particularly big. Season with pepper and place in a small ovenproof dish. Drizzle with a little olive oil and cook in a preheated hot oven for about 35-40 minutes, until cooked through. You can serve this with some steamed French beans or a simple salad. Before you begin, if you’re using bamboo skewers, soak them in water for about 30 minutes so they don’t burn when cooking. You’ll need about 8 peeled, cooked and defrosted tiger prawns per person. Make sure they’re fully defrosted then place in a bowl with ½ a chopped red chilli, 1 tbsp olive oil, the juice of ½ lime and some salt and pepper. Place in the fridge and marinate for an hour or so. When you’re ready to go, preheat the grill and thread the prawns on to the skewers. Grill for a couple of minutes on each side. Meanwhile, mix 6 tbsp natural yoghurt with a handful of freshly chopped mint. Serve with the prawn skewers. A 500g pack of lamb mince should make about 6 good-sized burgers. Empty the mince into a large mixing bowl and add a beaten egg, a handful of breadcrumbs, ½ tsp turmeric (optional), a handful of freshly chopped mint and ½ chopped red chilli. Mix the ingredients together well with your hands and shape into burgers. Place them on a large plate, cover with cling film and place in the fridge for about 30 minutes. When you’re ready to cook, heat a little oil in a large frying pan and cook the burgers for about 8-10 minutes each side, until cooked through. Serve in warm pitta bread with some hummus and a side salad.